Exciting New Product in the Isagenix Range! 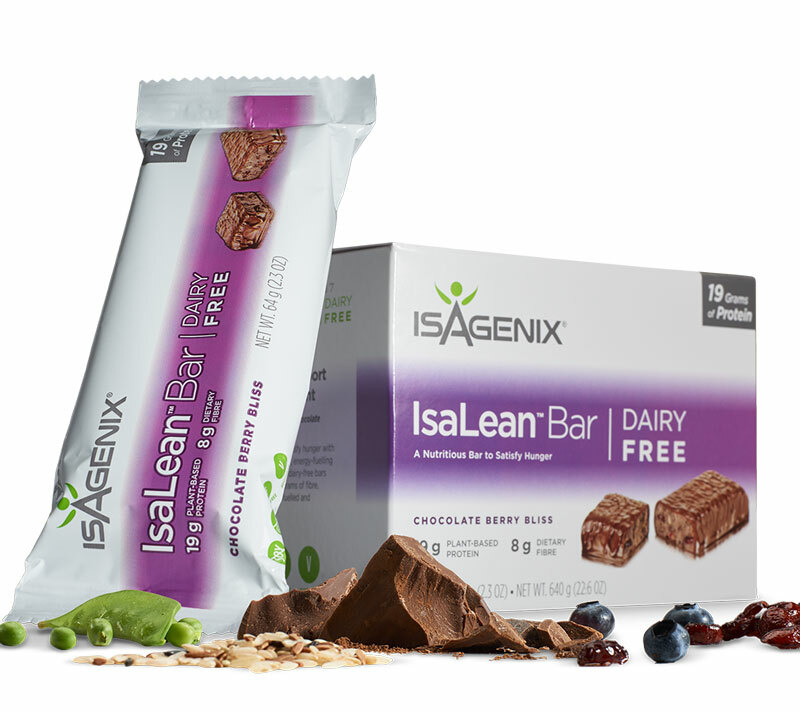 All new for your tasting pleasure, the Chocolate Berry Bliss Dairy Free IsaLean Bar is a nutritious and satisfying snack or daily meal replacement. Loaded with high-quality protein, energy fueling carbohydrates, healthy fats, and a healthy dose of fibre as well, these tasty treats are designed to curb hunger and provide your body with the nutrition it needs but seldom receives from other bars and snacks on the market. What Makes These Bars So Great? 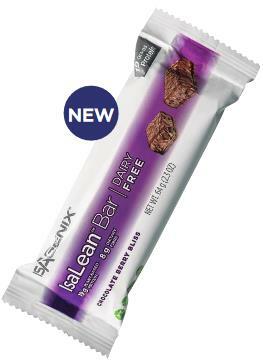 IsaLean bars are one of the most versatile items available for the Isagenix diet! They contain all of the nutrition and energy you need to replace an entire meal, but can also be used as an added boost before a workout or any time hunger strikes. Because the energy-boosting components of IsaLean bars provide a steady release of energy, you won’t experience the blood-sugar spike that can cause you to crash mid-workout. These bars are suitable for anyone: they are vegan and contain no dairy, gluten, or soy. They are even approved for children over the age of 4. They have the perfect balance of ingredients to help you lose weight and build lean muscle. They come in a tasty Chocolate Berry Bliss flavor, so you won’t feel like you’re being deprived while reaching toward your weight-loss goals! These IsaLean bars contain a whopping 19 grams of protein derived from natural ingredients such as pea and brown rice, making it the perfect snack to build lean, toned muscle. The bars also contain 8 grams of dietary to keep you feeling fuller longer, minimizing your caloric intake and promoting rapid fat burning. They also contain carbohydrates and good fats to boost your energy and fuel your workouts. These bars are the perfect balance of nutrition. One of the most important goals of Isagenix is to promote well-rounded health, and these bars are no exception. When used as a meal replacement, the bars will keep your calorie intake to a minimum, allowing your body to enter a state of ketosis and burn fat quickly. Research shows that replacing meals with bars or shakes leads to faster weight-loss results. However, IsaLean bars are also great as a snack. When cravings hit, it’s easy to be tempted to grab the most convenient option, like chips or candy. If you have an IsaLean bar handy, you won’t have to sacrifice nutrition for the sake of convenience! Just cut one bar in half, and you’ll have a handy, tasty, nutritious snack! Chocolate Berry Bliss IsaLean Bars are an ideal solution for anyone in search of a delicious, convenient, and highly nutritious snack. Like other IsaLean Bars, they’re perfect for today’s hectic lifestyles and can be enjoyed for a boost of nutrition at home, work, the gym, or anywhere else you happen to be. In addition to serving as a complete dairy free meal replacement and an excellent source of superbly balanced nutrition, they’re also an ideal pre-workout fuel and provide the perfect ratio of carbs and protein for more sustained energy from beginning to end. Using Chocolate Berry Bliss IsaLean Bars as healthy snacks or meal replacements can help you resist chips, cookies, and other unhealthy snacks, allowing you to stay on track and reach your fitness goals. Compared to inferior meal replacement bars, Chocolate Berry Bliss IsaLean Bars contain superior nutrition with a well-balanced blend of premium dairy free protein, energy boosting carbs, and healthy fats. With minimal calories as well, there’s no better dairy free snack option available for safely and effectively achieving your weight loss goals. Chocolate Berry Bliss IsaLean Bars are low-glycemic and provide an ideal ratio of quality protein and carbohydrates for sustained athletic performance. Eating a bar before your workout will help you perform better and enhance your endurance and/or weight training activities. Chocolate Berry Bliss IsaLean Bars are perfect for just about everyone. Not only do they taste great, but they’re low glycemic, gluten free, and kosher as well. Kids four and up can even enjoy them for a tasty boost of parent approved nutrition. More people trying to lose weight get off track due to cravings and hunger pangs than any other reasons. Not only do they hit suddenly, but they can make you lose focus and opt for the closest nearby snack option, which usually isn’t the healthiest choice. These satiating and uber convenient meal replacement bars will become one of your go-to tools for combating hunger pangs, meeting your nutritional needs, and shedding stubborn kilos. Research shows people who use meal replacement bars and shakes lose on average two or even three times more weight than those who don’t. In addition to being incredibly convenient, they can help you avoid unhealthy foods loaded with calories. With more premium protein and balanced nutrition than conventional bars, Chocolate Berry Bliss Dairy Free IsaLean Bars are even more effective. Plus, they’re vegan-friendly and glucose free, so they’re suitable for everyone and will help keep your body’s sugar levels well-balanced. As a result, your body will be able to burn stored fat and build lean muscle. You’ll even experience an energy boost too! Not only are IsaLean Bars great for losing weight, but they’re capable of enhancing athletic performance as well. Since they don’t spike blood sugar levels like other meal replacement bars, they provide you with the sustained energy needed for long, strenuous workouts. Whether you’re weight training or taking part in high-endurance activities, Chocolate Berry Bliss IsaLean Bars have you covered. They’re also a perfect solution when you’re in need of a healthy snack in between meals. Just cut one in half and use it to curb your hunger and enjoy an energy boost to fuel you through your day. Each bar is individually packaged, so it’s easy to stash a few away in your briefcase, purse, or office desk. Eating right honestly doesn’t get much easier. Chocolate Berry Bliss IsaLean Bars are approved by moms too. Since they taste great and provide a healthy dose of premium nutrition, they make a terrific after school treat. In fact, these tasty bars are approved for children over the age of four. Lactose free and containing branched chain amino acids, they actually promote growth and safe muscle development. It can be tough to eat right these days. Between our hectic lifestyles and easy access to foods that are just plain terrible for our health, it can be downright difficult to get the nutrition your body needs. When there are no healthy options available, most of us just grab whatever is close at hand, which in most cases isn’t the healthiest choice. Thanks to delicious Chocolate Berry Bliss IsaLean Bars, however, you’ll be able to eat right on the go, stay on track, and meet your fitness and weight loss goals! Chocolate Berry Bliss IsaLean Bars are designed to be enjoyed as a snack or meal replacement. For a quick snack, simply cut one in half and enjoy. You can also eat an entire bar when you’re unable to have an IsaLean Shake for the nutrition and energy you need to power through the day. Currently, the Isagenix Dairy Free IsaLean Bars only come in 1 flavour in Australia and New Zealand: Chocolate Berry Bliss.